The late arrival last year from Long Beach Jordon High School did not make the sophomore laden AVC team. He and the coaching staff agreed it would be to his advantage to “red shirt” at AVC and get used to college academics and basketball. When I spoke to Keshaun recently the first question I asked was, What was the most important thing you learned from last year? His response was completely unexpected. “If you are going to make this team, you are going to have to be very hungry!” Keshaun’s year in the weight room gave him 10 pounds of muscle and he gained an inch in height as well. Coming from a high school basketball background where he excelled in wide open up and down style of basketball where defense and half court sets were not high priority, the red shirt year at AVC was both frustrating and productive. 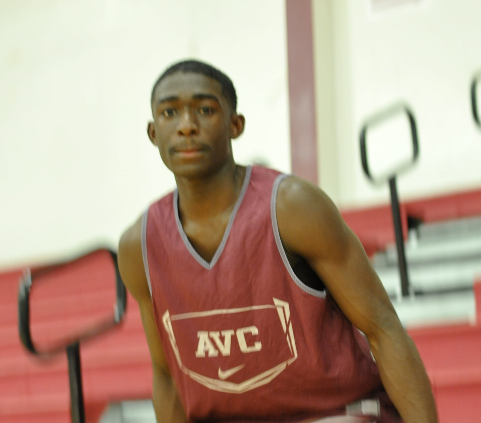 One of the most athletic players on the AVC team, he worked hard on shooting, shot selection, ball handling, and defense. He feels that to get playing time this year, his defensive skills are the key. His jumping ability, speed and high energy with foot work now added and experience he has gained will give him a chance to be that “shut down defender” that AVC has every year i.e. Brandon Ruffin. Mack also mentioned that to get the university scholarship he covets, he will have to continue to improve his ball handling and shooting. Keshaun has improved in both of these areas over the past year but with hard work he can improve even more. I asked Keshaun what his goals were for the upcoming year. “To get better and to help the team win the state tournament.” One of his “nosey team mates” who was listening from afar piped in about Keshaun, “Key’s athleticism will be very important to AVC this year.” Keshaun laughed and said that he might just hire his team mate as his “agent.” This is going to be a very interesting year watching to see how far Keshaun will come in his freshman year. Keshaun Mack, 6’4”, 195 wing, had a breakout tournament this past weekend at 2016 Fall Shootout. Its taken him awhile but the freshman wing turned up the aggression to match his physical and athletic skills especially in the defensive area. With his long wing span, quickness and high energy, Key could be an important player this year in AVC’s season! He can handle defensively taller players with his jumping ability and smaller players with this speed. Could be the defensive stopper ever college team needs.